Gritton joined Argyle after he was spotted playing for Cornish side Porthleven. 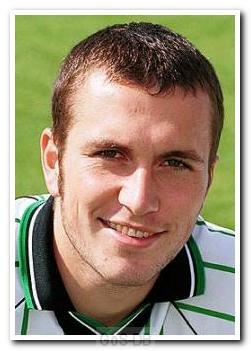 He spent four years at Home Park, playing up front only occasionally, usually as a substitute. He had loan spells at Yeovil Town, Shelbourne and Torquay United, joining the latter permanently when his Argyle contract came to an end. Gritton scored 16 goals in his first season at Plainmoor, helping the club to win promotion, and continued this good form the following year. Due to the club's financial difficulties, he was sold to Grimsby Town, whom he left a year later to join Lincoln City. Unable to gain a regular first team place he had a spell on loan with Mansfield Town before being released and signing for Macclesfield Town. His goalscoring form there led to a transfer to Chesterfield 18 months later. A funny memory I have of Martin was during the first few months of Sturrock's reign when he bought him on with only a few minutes left. I can't remember who it was against but we were winning by only a single goal and in an attempt to wind the clock down Sturrock substituted Gritton but instead of slowly walking off, Gritton ran over to the touchline bemused as he had only just come on! I remember finding Sturrock's comments in The Herald the next day very funny, they were something along the lines of.... "When you're trying your best to win a game and give the players a breather, what does Gritts do? He runs off! There is a naivety to his game." I'm glad that he wised up and had a decent career!